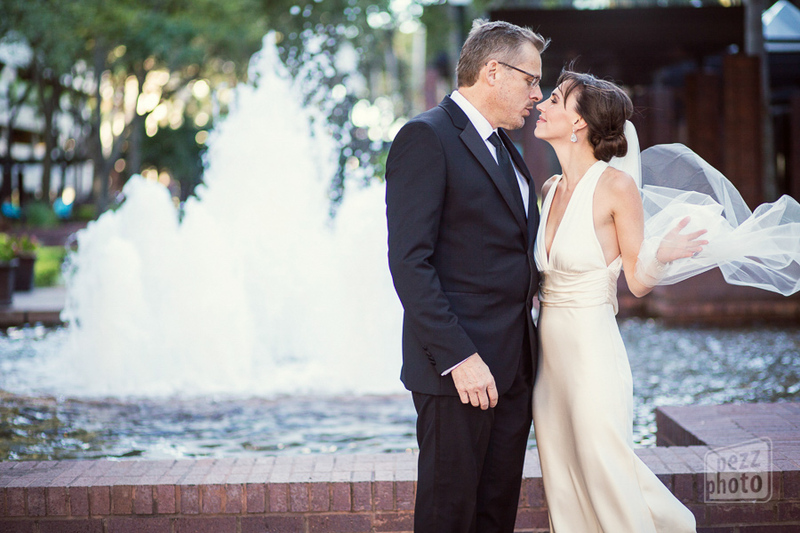 Gina and William’s wedding was definitely a night to remember at The Tampa Club in downtown. It was one of the most romantic evenings ever. 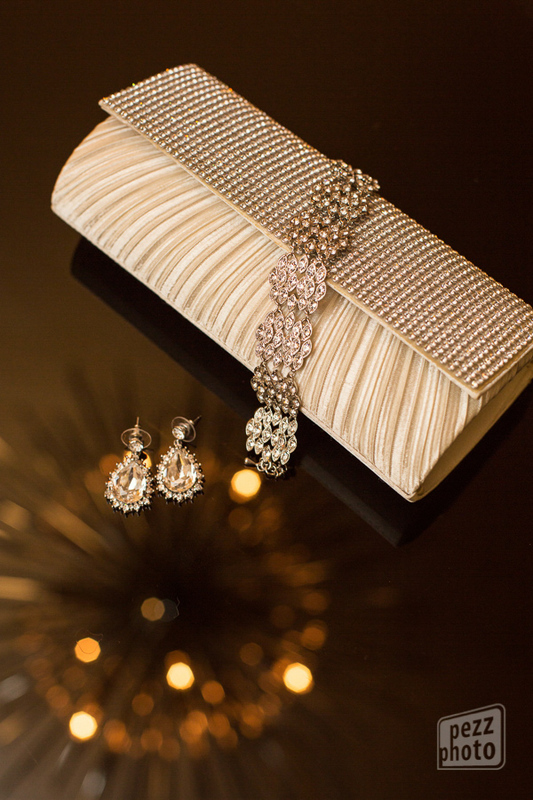 Gina’s style was simple yet elegant and she loved the idea of celebrating her special day with her close family as her guests. 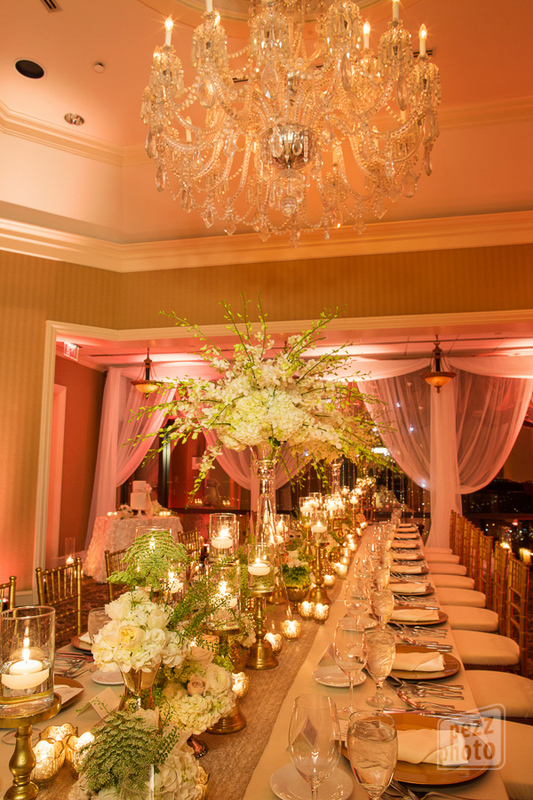 With one long feasting table as her head table, she was able to incorporate extravagant decor and set a warm, inviting atmosphere which complimented the breathtaking night view of Tampa Bay. 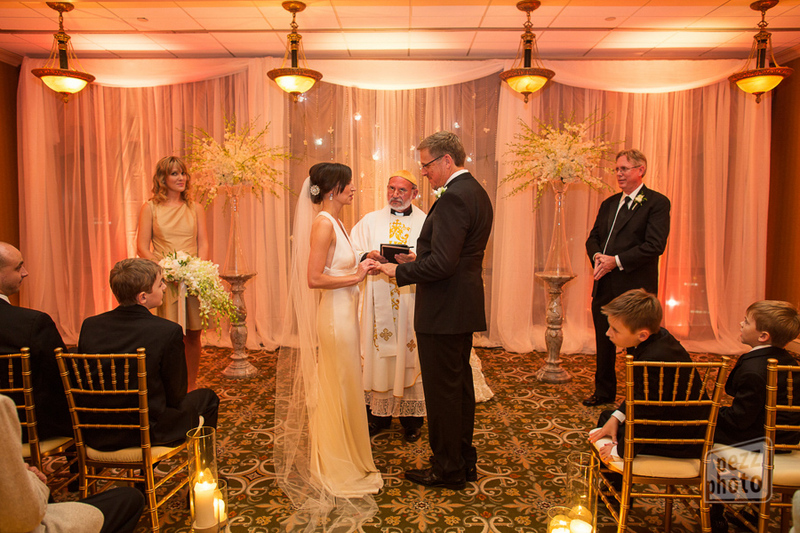 Many thanks to Amy Pezzicara for capturing every beautiful moment and sharing these moments with all of us. 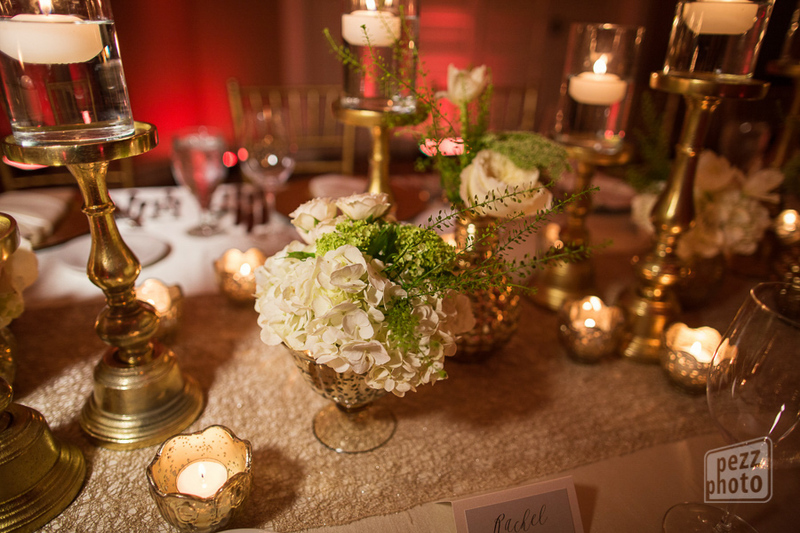 La Vie en Rose provided all florals, chargers, centerpieces, candles, drapery, specialty linens, and lighting. Gina & William on their wedding day. They’re such a great looking couple. This photo speaks thousands of words and you can’t help but feel the electrifying love that’s shared between them. 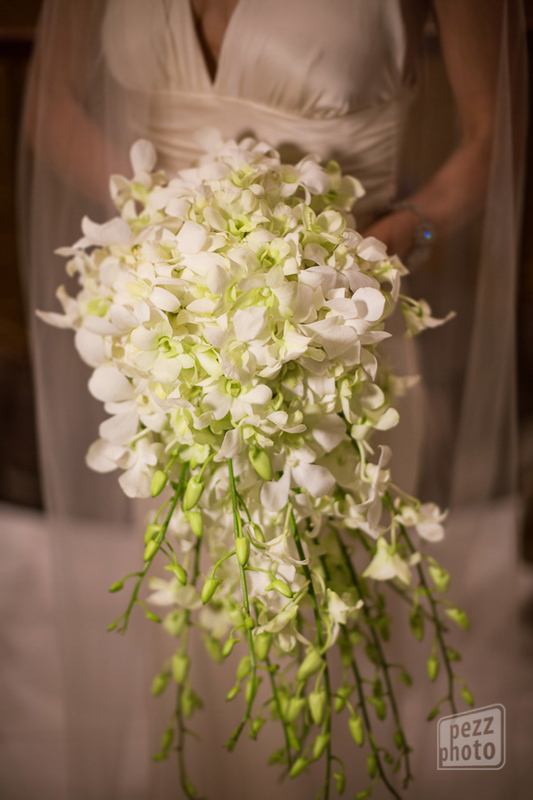 Gina chooses to have a cascading white orchid bouquet that compliments her sleek, ivory dress. 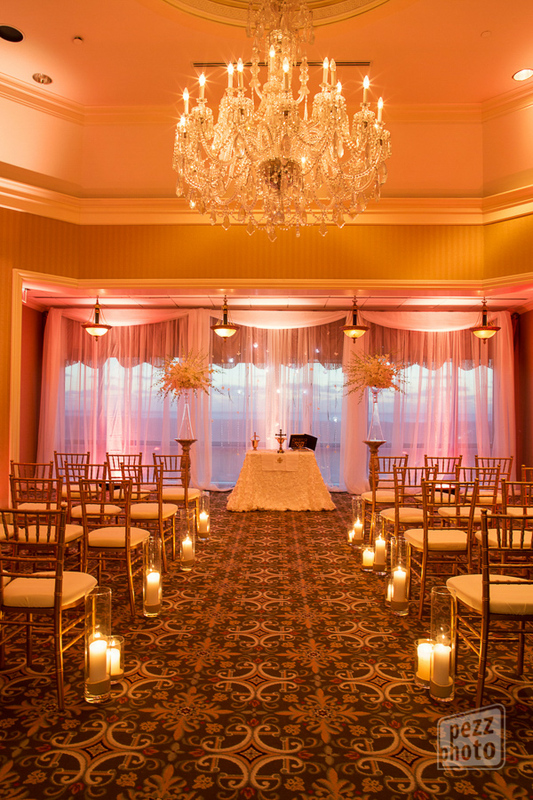 The ceremony took place inside the Sunset Rotunda on the 42nd floor overlooking Tampa Bay. 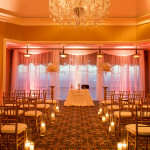 We softened the harsh sunset with swags of fabric, creating a soft glow for the ceremony. 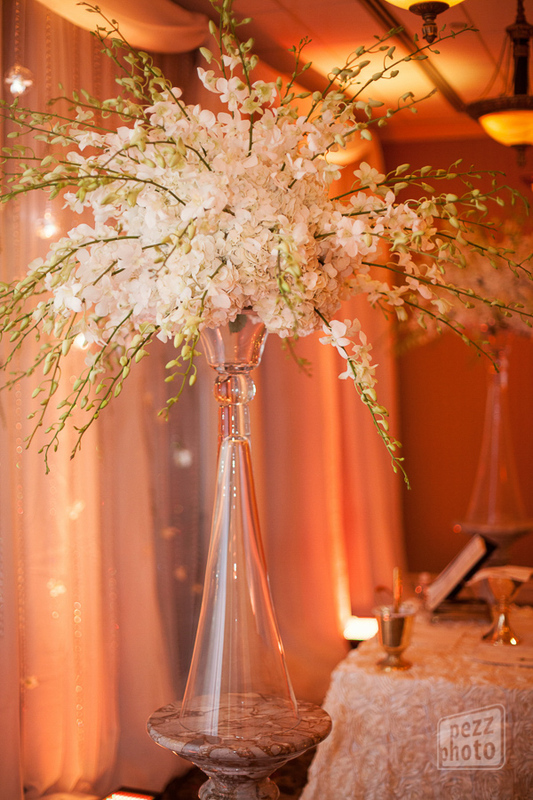 Tall, orchid spray arrangements to frame the bride and the groom. 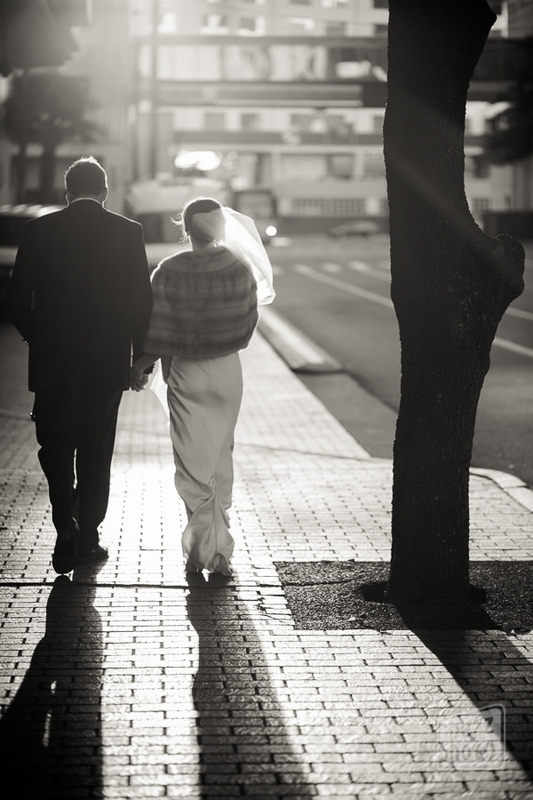 A sweet moment of the bride and groom.. as two become one. 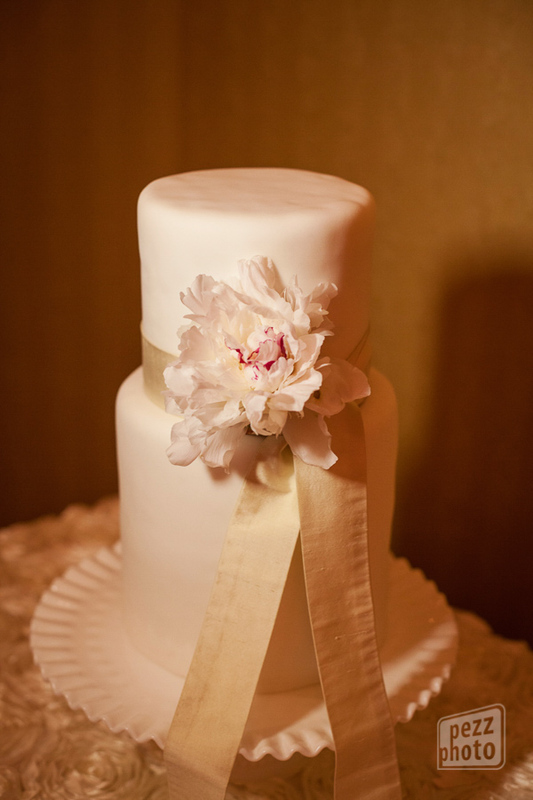 Gina’s maid of honor’s bouquet consisted of hydrangea, ivory rose, hypericum, veronicas, and explosion grass. 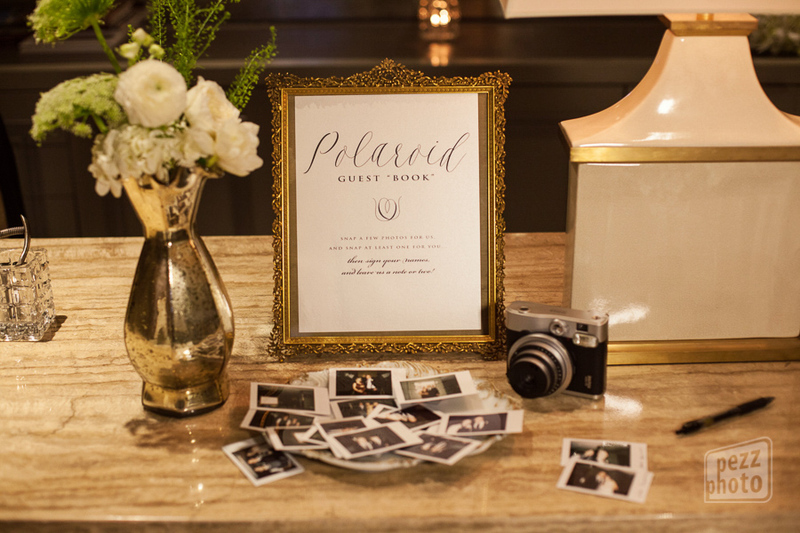 What a unique idea to snap polaroid pictures instead of signing into a guestbook! The bride and groom upon entering the room.. it was a delight to see the bride’s reaction. She was so very happy! 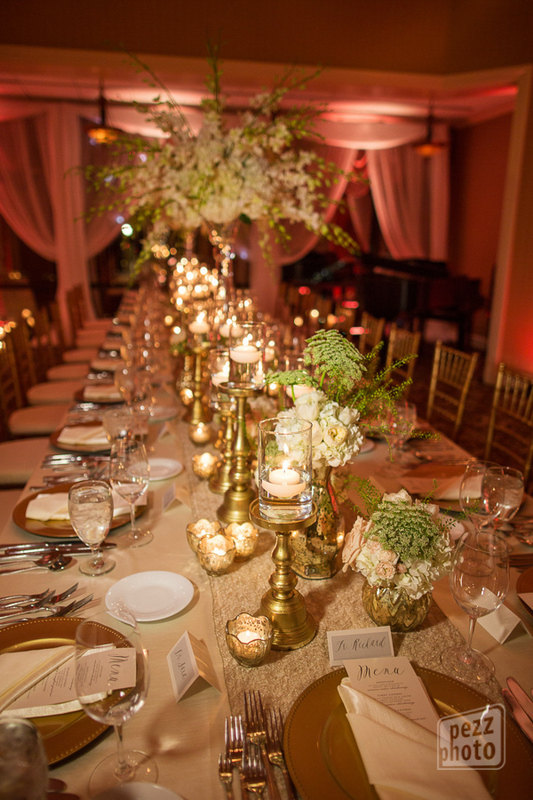 The long, feasting table was lit up with what seemed to be a million candles and floral decor, making it a very romantic evening… the downtown lights shined through the sheer drapes. 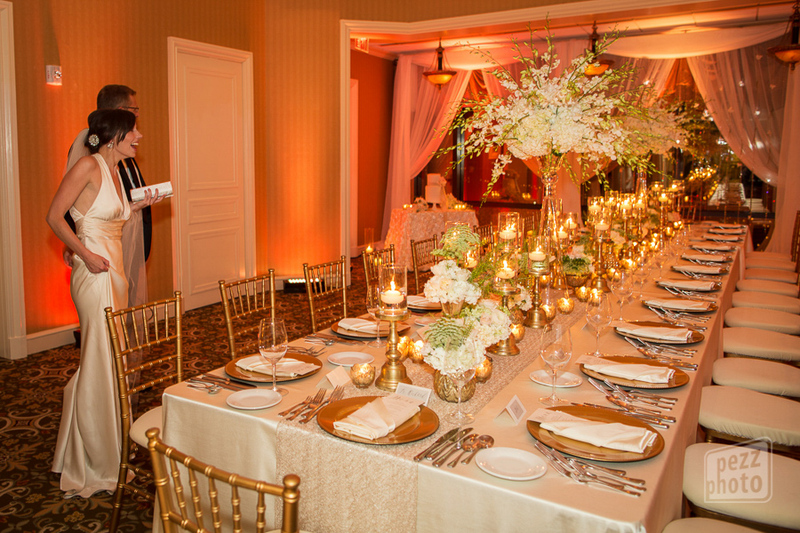 Gina and William’s reception dinner was one that will be remembered for the rest of their lives. 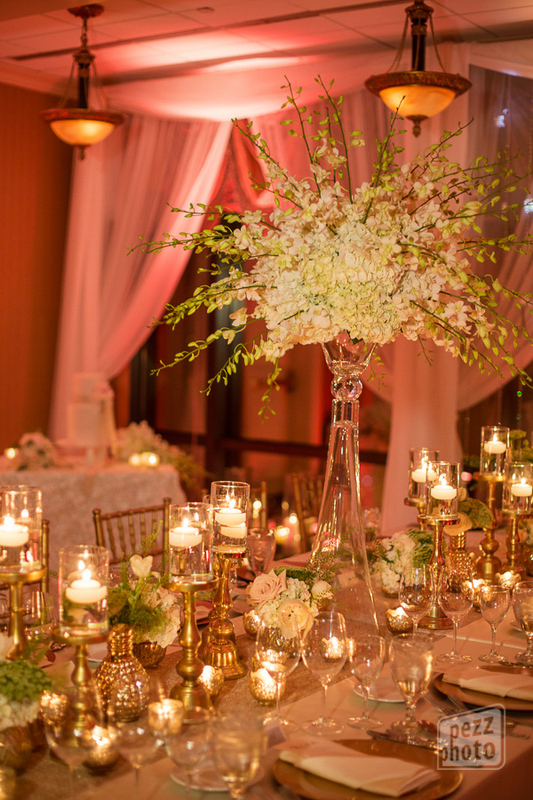 From the lights to the decor, the ambiance of the room gave the it a warm, evening glow… Gina’s style is represented most in this photo… as the bride mixes traditional, romantic table settings with modern and clean florals. Check out the amazing chandelier! 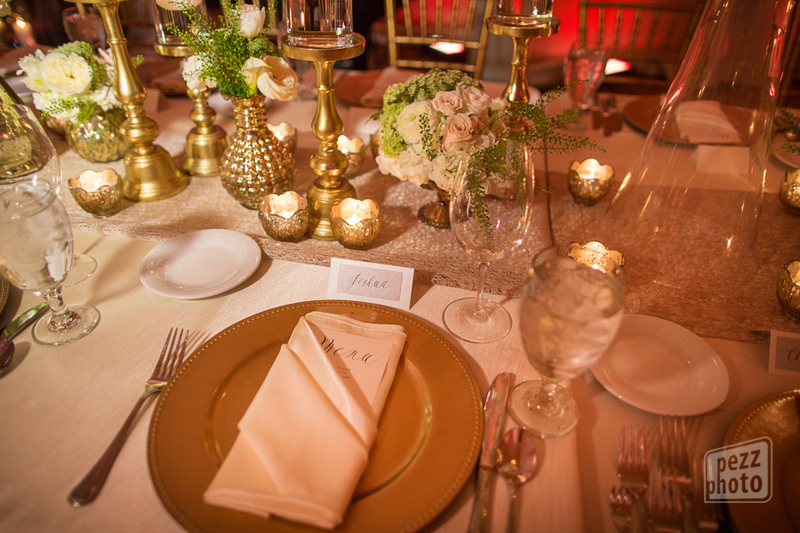 The centerpieces varied in height and size, giving the table more texture and depth . 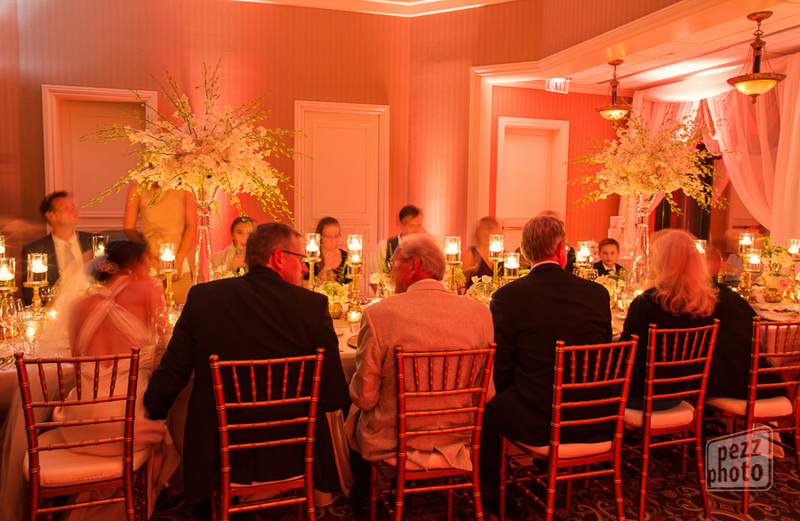 A beautiful photo of the family enjoying the reception dinner. The texture of the runner provides a base to accentuate the grandness of the table, pulling together all of the gorgeous elements. See how the table continues on as far as the eye can see.